A culture of support is a distinguishing feature of the University of Louisville. 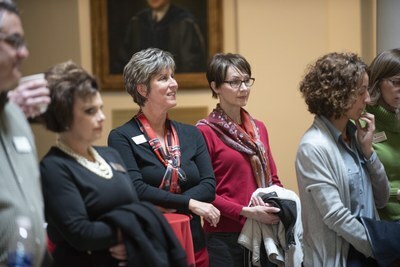 The University recognizes and validates women's work perspectives. All three campuses provide an open and safe climate where the criteria for success and achievement incorporate the unique skills and values women bring to the institution. The University believes a campus environment that emphasizes collegiality and cooperation is more productive than an environment that fosters competition. The University of Louisville recognizes employees are its single greatest and most valuable resource. Fiscal restraints are anticipated to continue to the foreseeable future. The University cannot afford to squander any valuable resources. Therefore, the University wisely invests in its human resources, nurturing and actively encouraging all employees to develop to their fullest potential. Employee contributions and achievements are rewarded in meaningful ways. This support of accomplishment is balanced with humane concern for personal and family values and responsibilities, enhancing job satisfaction and job performance. Multiple organizations on our three campuses contribute to the work of ensuring a world class working environment. Several are listed in the left menu bar along with other helpful links.